Experience the breathtaking majesty of the Simien Mountains on this comprehensive tour of the ‘Roof of Africa’. Trek to peaks breaching 4,000 meters, experience the panoramic vistas, cross the rivers that flow into the lowlands and get up close with endemic Gelada Baboons and other rare and endemic flora and fauna. Spend your nights camping under the stars with as much support as you need, whether you want to provide your own gear and cook yourself, or are happy to use the local mules and excellent cooks. Views from the Simien Mountains. 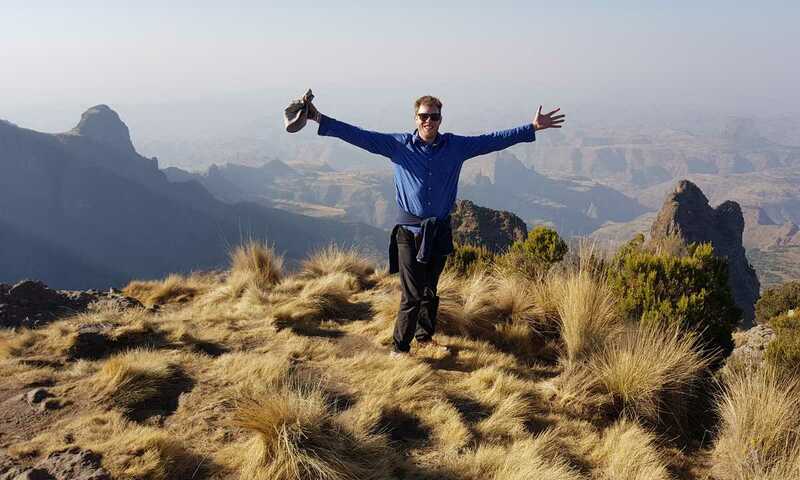 Trek deep into the Simien Mountains with our friendly and knowledgeable local guides. Sleep beneath some of the brightest stars in the world with provided camping gear that can be portered each day between camps by mules. Spend time spotting, or in the case of the Gelada monkeys, just sitting amongst some of the rarest animals in the world. Summit Ras Dashen, Africa’s tenth highest peak and Ethiopia’s highest point. When it’s time to relax, take a swim in the rivers of the lowlands and enjoy the local coffees in the camps or enjoy delicious food cooked for you around the campfire. Day 1: Pickup from Gondar, Bahir Dar or Debark. A car will pick you up and take you to the Simien Mountains National Park. Here, you’ll meet with your trek leader, who’ll talk you through all aspects of your upcoming adventure through the mountains. Your first destination is Sankaber camp. After driving into the park, the last 2-3 hours or so will be an acclimatization hike, but you’re more than welcome to hike the entire distance if you want to get stuck in. You’ll ascend over 3000 metres above sea level, surrounded by jagged peaks and Gelada Baboons. Once you arrive at Sankaber, you’ll be welcomed with drinks and a delicious dinner at the campsite. Day 2 - Introducing, the Simien Mountains National Park. The first day of hiking starts with a nourishing breakfast before you head out to the trail along the ridge. There’s a wonderful vantage point which offers some incredible views over the foothills some 800 metres below. The mountains are known worldwide for their biodiversity and your guide will point out all point out flora and fauna of note. Along the trail, Gelada Baboons, Klipspringer and Walia Ibex make regular appearances and birds soar on the thermals below. Today you’ll head to Imet Gogo, a headland at the edge of a ridge that stands close to 4000 metres with unbelievable 360 degree views of the surrounding mountains. You can see west, back towards Sankaber and Geech, and south east along a large Gorge towards tomorrow’s destination, Inyate. Next take the trail through Giant Erica woodlands before before emerging on the moorland at Inatye, the second highest peak in the western part of the park. Tonight you’ll spend the evening at Chenek camp which is often the best spot to see both Ethiopian wolves and Walia Ibex. Rise with the sun over some warming porridge before starting your ascent up Kiddus Yared, the second highest peak in the Simien range. Afterwards, the trail follows the ridge westward - for those who haven’t had quite enough mountain-conquering, you can trek up Abba Yared at 4409 metres before joining the livestock paths that head towards your campsite at Arkwassie. From here, it’s pretty much all downhill as you press on to our campsite. After a relaxing breakfast, head over the ridge and down into the lowlands. The path clings to the highlands and leads to a pretty location called Sona, before winding down off the mountains and into the river systems below. The scenery here is fantastic, especially if you’re coming just after the rainy season and the flowers are in full bloom. At the bottom, swim in the rivers at an altitude of around 2000 metres. Continue on to your campsite at Mekerabiya, a pretty village underneath Imet Gogo. With temperatures warmer than previous days, this is a great spot to relax and enjoy the views of the mountain tops in the distance. Set off along the river valley and back over onto the ridge. This is the easiest walk of the trip and is a real treat, with attractive villages and farmland peppering the trail and the omnipresent peaks of the Simein range in background. Enjoy another swim and have a coffee in one of the villages before arriving at the picturesque village of Mullit. From Mullitm it’s a short 2 hour walk to the nearby roadside town of Adigrat Arkay. Here you can have a coffee or beer while you gear is loaded on transport for your onward joinery - perhaps a return to Debark. We recommend adding a night at the incredible Limalimo Lodge to relax after your adventure. This trip can run as a group trip, with prices starting from $1,973 per person for a complete group. If you are looking to join a group or you are a solo traveller we will help to form likeminded groups of travellers. Please let us know your travel plans. Transfer into the park and pick up from Adi-Arkay to Limalimo lodge. Next day transfer to Gondar from Limalimo lodge. Entry fee, English speaking guide, scout, cook. Food and bottled water (breakfast, lunch and dinner). Tent, camping and cooking gear. Mule and mule handlers for transporting camping gear and your luggage. One night at Limalimo lodge.